Holidays in Greece, especially the Greek Islands, have always been high on my happy list. Until this year, it had been a good few years since I’d given Greece the love it deserves but I put that right recently with a week in Crete, the largest of the Greek Islands. 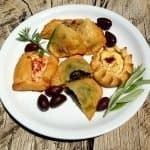 Rethymno was the location for a blissful week of June sunshine, relaxation and Greek food indulgence. So, where to stay in Rethymno? Our home for the week was Villa Rethymno Beach IV. At the time this was a James Villas property but is no longer advertised with them. 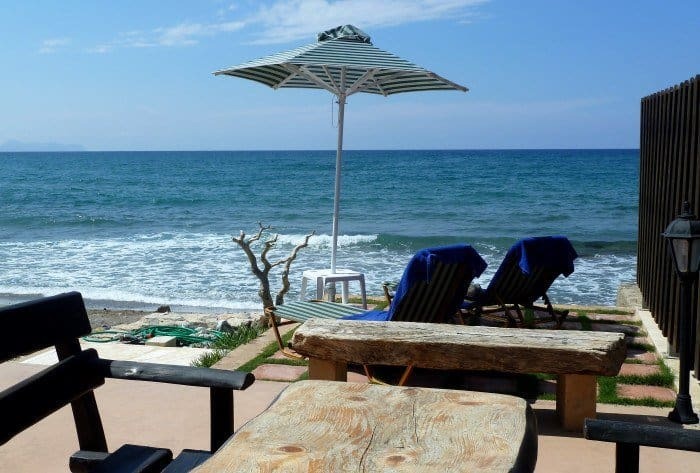 The rustic villa is just a short walk from Rethymno town and the perfect beachside spot for soaking up the sun as well as the town’s history and Grecian charm. Rethymno, on Crete’s northern coast, is an ancient, picturesque town which was once ruled by the Venetians and then by the Turks. There’s a lot to see including the Fortezza, an ancient fort, the old Venetian harbour, lighthouse and a very pretty old quarter. 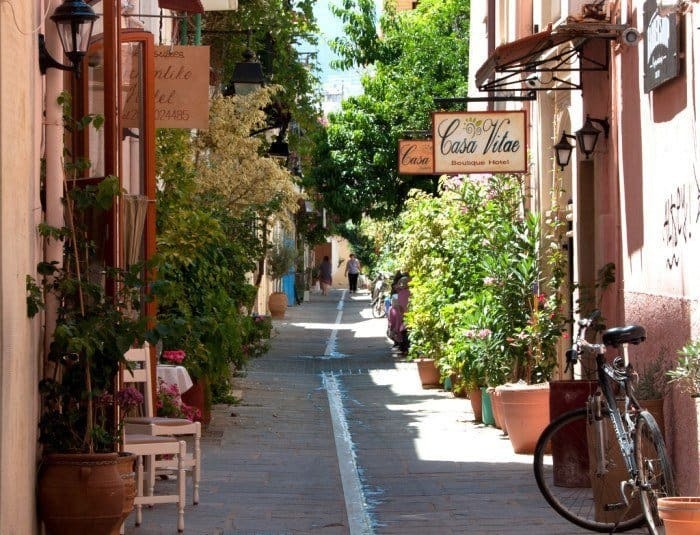 The old town is a honeycomb of alleyways lined with restaurants, shops, bars and overhung with fresh green vines and vibrant bougainvillea. Our Crete accommodation was Rethymno Beach Villas which are 1k to the west of the town, around a 20-minute walk, which we did most days. The Rethymno Beach Villa is one of four integrated into a renovated building on the beach front. And I mean right on the beach, just a flip and a flop from the door to the sea. Fifteen flips and fifteen flops until I was actually paddling in the water! It was so lovely to drift off to sleep each night with the sound of the waves lapping on the shore and to wake each morning and see the turquoise waters from my pillow. Yes, that close, and I insisted on leaving the shutters open each night for that very reason! 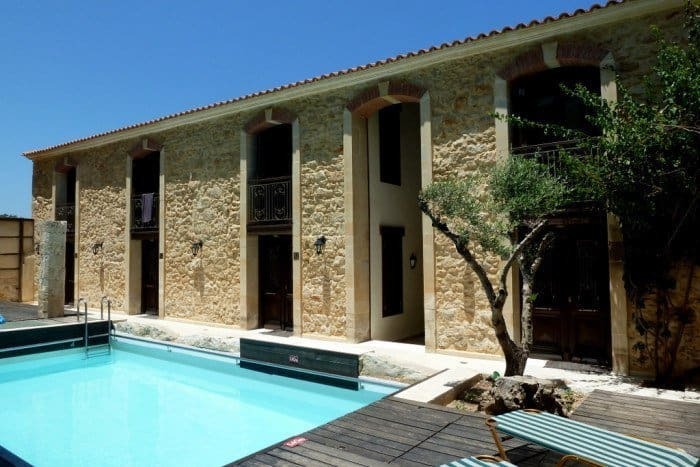 The villas have an artisan feel and have been beautifully renovated from an old stone building, keeping many of the original features. 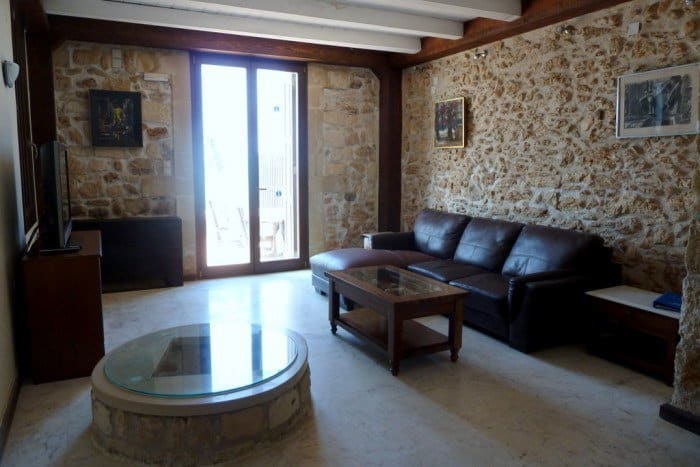 There are exposed stone walls, wooden beams, marble and wooden floors and the original well (glass-covered) in the living area. I’d love to find out about the history of the building. The entrance to the villa is via a narrow alley from the road and through a rustic wooden gate which opens onto the pool area. Our entrance door was by the pool and there’s also a passageway through the villas straight to the beach. The entrance door opens onto the kitchen dining area which has a chunky wooden table and chairs. The kitchen is fully equipped with everything needed for self-catering including cookware, crockery, dishwasher, microwave, oven, hob, Fridge/freezer and coffee machine. There’s also a BBQ outside. The living area has a large, comfy leather sofa, digital flat-screen TV, DVD and docking station, a selection of paperbacks and air conditioning. The patio doors look straight out onto the beach and outdoor area. There’s also a handy downstairs cloakroom. Although the villas are conjoined each has its own outside area with sun beds, parasol, table and open dining area with rustic table and chairs which is slightly divided for privacy. By the pool, which is shared between the villas, is a pool table and a communal hammam which we didn’t use. The bedrooms and main bathroom are upstairs on the first floor. Both bedrooms have patio doors and a mezzanine level although the steps to this are quite steep and cordoned off. The main bedroom, with double bed, looks out over the beach and the second bedroom with twin beds looks over the pool. There’s air conditioning in both, and again, exposed stone walls and brickwork. In the hallway, there are two very spacious wardrobes with drawers – plenty of room for a family of four’s kit for a week or two. There’s a sturdy metal safe, iron and ironing board in the wardrobes and a washing machine in the bathroom. 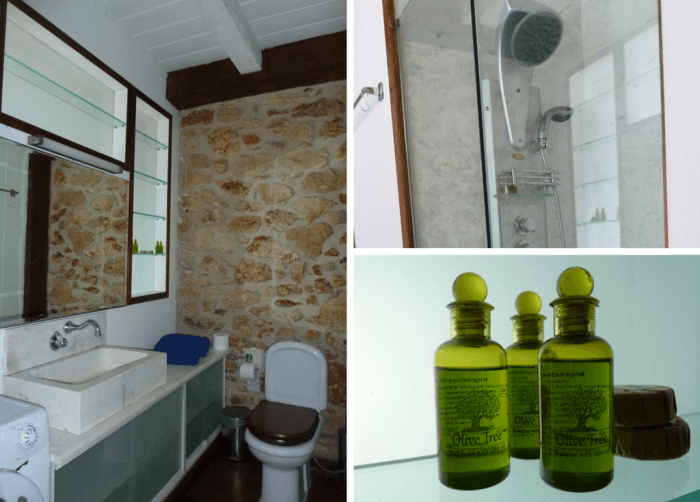 The bathroom has a stone sink, WC and large shower cubicle with hydro massage shower. There’s no bathtub. Toiletries were supplied and soft white towels, bathrobes and slippers. The towels and bed linen was changed halfway through the week and the villa cleaned. 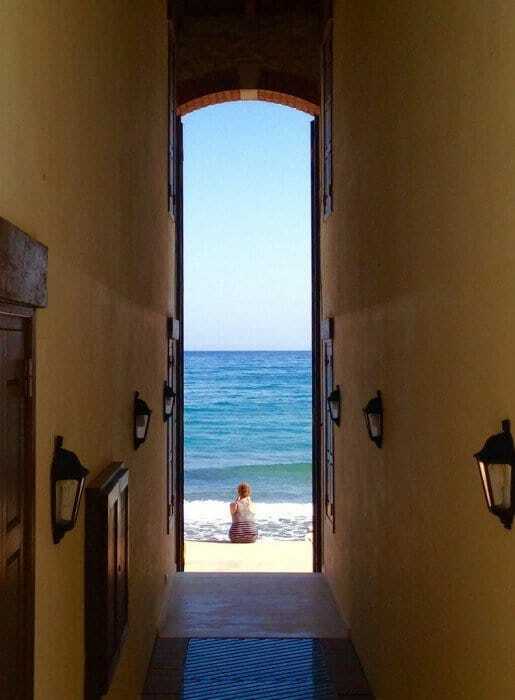 I haven’t been on a self-catering break for years but one of the things I loved best about our villa was that I could make breakfast, usually Greek yoghurt and fruit, and sit and eat it with the sun on my face and the sea at my feet – fabulous! The beach outside the villas is quite narrow but widens out further along. This is actually a good thing because it means that people using the beach tend to use the wider part leaving the area by the villas virtually unused. 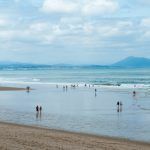 There are two supermarkets within walking distance and a mini-market by the entrance to the villa selling just about everything you’d need for a self-catering break – except fresh bread. But that’s because there’s a bakery next door, run by the friendly Zac, who bakes all his bread and pastries on the premises. You won’t get bread any fresher. I recommend you try his apple turnovers made with home-grown apples and dusted with sugar and cinnamon. Delicious. 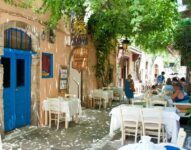 There are dozens of restaurants and tavernas in the old town serving traditional Cretan food and more international dishes. We had an excellent meal and wine at Castello. There are different areas to eat; at a table in the narrow alleyway or you can eat in their patio courtyard on one of two levels. We booked and ate on the second level up which was surrounded by vines and greenery and was very pretty. The food is very good; I had lamb with a thyme honey sauce which was very tender and tasty. We also ate in the more casual Loggia Taverna in the town who served great mezes in a pretty alleyway. All the restaurants we ate at served up a free dessert at the end of the meal and they were all really good so remember to save some room! If you’re staying in the villa you don’t need to go into Rethymno town itself as there are also some excellent restaurants and hotel bars less than a ten-minute walk if you turn right when leaving the villa. Many of them have tables overlooking the ocean and have menus of both traditional Greek fare and more international dishes. Prima Plora was excellent and we had a selection of mezes on a table right by the sea. We also had an excellent Cretan meal in the restaurant at Delfini Beach hotel who also have a more casual outside tavern area by the water serving international cuisine. Villa Rethymno Beach I, II, III and IV are perfect for a couple or families with two children sharing the second bedroom. Cots and highchairs are available on request. If you don’t want to eat out everything needed to self-cater is provided except the food. Wi-fi was included which was fast and reliable, as was the mobile phone signal. Keys are left in a safe place so you can let yourself in on arrival. Check-in from 15:00 hrs and depart by 11:00 hrs. 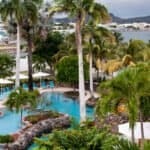 Car hire can be arranged through James Villas but we didn’t want to venture too far so we just booked airport transfers. My thanks to James Villas for hosting my stay at Villa Rethymno Beach IV. All views, opinions and Greek Island love are entirely my own. There are affiliate links on this page which help to keep this blog running. If you choose to purchase items through these links, I will earn a small commission at no extra cost to you, thank you. 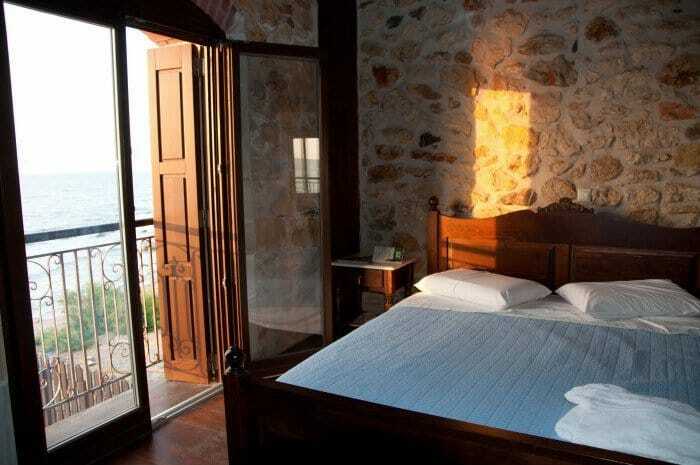 What a wonderful place, with that amazing view from the bed is simply paradise! I haven’t been to Crete but I’ve heard that it’s beautiful. 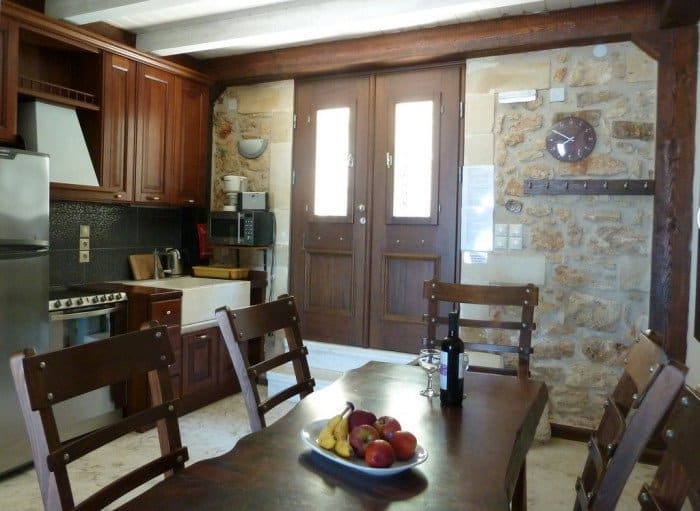 The villa seems to have everything that you need and self catering is a great way not to put weight on during a holiday as you can eat light in the evenings! It was very chilled but I have to confess we did eat out every night! I haven’t been to Crete since I was 14! But funnily enough, I think it was Rethymno we stayed in and I loved it! I love the idea of a beachside villa with a fresh bakery right next door though I must admit you’d never catch me using that ironing board on holiday! ? You’ll be pleased to hear the ironing board and iron remained untouched!